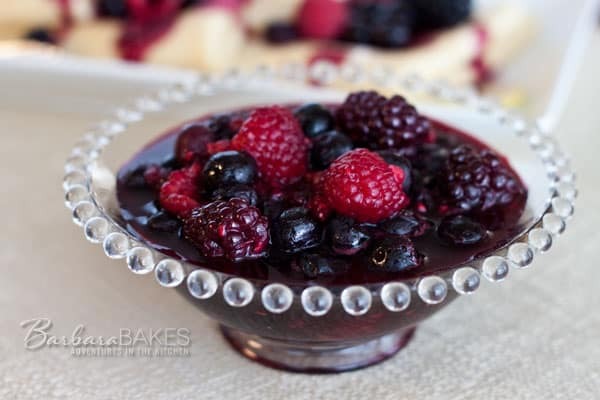 A quick cooking berry compote made with red raspberries, blackberries and blueberries. A sweet sauce for your favorite breakfast or dessert. Sustainable Cooking For One is my Secret Recipe Club blog this month. Eating sustainably is an important element of Stephanie’s kitchen, so her recipes are healthy, low or no meat, and focus on in-season and local foods. Her cookbook One Bowl: Simple Healthy Recipes for One has tips and recipes for cooking healthy meals for one. I debated about which of Stephanie’s delicious recipes to make, but kept coming back to this simple, quick berry compote . It was the perfect addition to the Lemon Ricotta Crepes my husband was making me for my birthday. Fresh blueberries were a little too pricey at my market, so I used frozen blueberries instead. Blackberries are one of my favorite berries, so I added those to her recipe as well. Ideally, you’d use fresh, local berries that wouldn’t require very much sugar, but if your berries aren’t as sweet as you’d like, you may need to add a bit more sugar to taste. Stephanie also serves this simple sauce over ice cream, waffles, pancakes, or even enjoys it plain. Thanks Stepahine for sharing this one. I’ll look forward to making this again with some great local berries. Wash berries. Drain, but do not dry. Place into a microwave-safe bowl with the sugar and lemon juice or zest, if using. Cover and microwave for 3-4 minutes, or until the berries have melted and the juice is at a low simmer. Feel free to switch the types of berries, but the success of the dish depends on about 3/4 of the berries being soft and juicy. Yum! 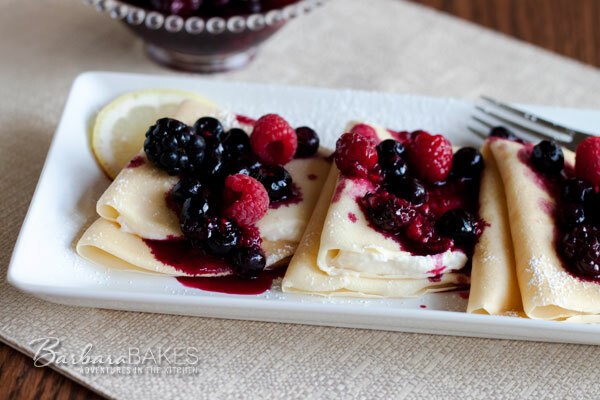 And so perfect for berry season and looks delicious with the crepes. We love crepes here. Beautiful! What a perfect summertime recipe. Great choice for this month’s SRC.